(Eagle News) — Senate President Tito Sotto on Tuesday, March 19, said the Senate will no longer agree to a meeting with the House of Representatives on the proposed national budget. Sotto made the statement as he expressed “confusion” over the conflicting statements from congressmen on the real status of the budget bill enrolled by the House of Representatives. Rep. Rolando Zamora, who was tasked by congressmen to deal with senators on the issue, had said the House had agreed to recall the budget bill, which the Senate has described as a “manipulated” version of the budget bill already ratified by Congress. 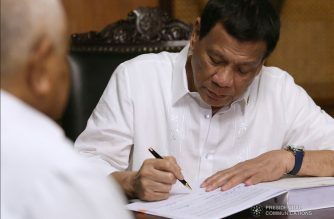 But Speaker Gloria Arroyo said the House-enrolled budget bill has not been recalled, with House appropriations chair Rolando Andaya Jr. saying such a move would require the approval of the House plenary in the first place. Senator Panfilo Lacson has said the plenary approval was no longer needed as the House-enrolled bill was a mere draft. “Ano ba talaga?” Sotto asked. 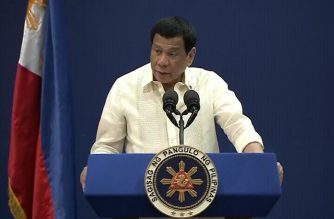 For the Senate’s part, Sotto said it would stand firm in its position the budget bill enrolled by the House was “violative of Article 170 of Revised Penal Code which is falsification of legislative documents” and would not be signed by him, a requirement before the bill is transmitted to Duterte. He said if the congressmen had issues, they should have raised these before both the Senate and the House ratified the bill, not after. 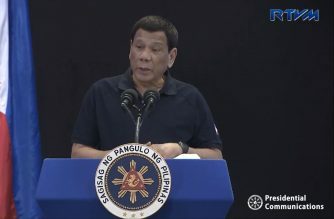 “Kung ano yung ni-ratify namin, kung ano yung pinasa namin, ‘yun dapat ang ipadala sa Presidente,” Sotto said. “So we’ll just wait for them to make up their minds once and for all,” Sotto said.